As soon as we found out we were pregnant I knew I was going to a birth center. Even though I had witnessed my sister’s birth at All About Babies, I toured a few in the area and though they were nice, I felt drawn and so comfortable with the awesome facilities at All About Babies. I met with Donnellyn and Hannah for my first visit and knew I was in good hands. Since this was my first pregnancy and I was somewhat clueless, I followed all directions; took every supplement, drank every tea plus Ningxia Red, ate right (excluding the m&m’s), and walked almost every day. This advice obviously works because my labor went very well. My contractions started at 3am and I stayed home to work thru them till 3pm. We were waiting for my contractions to be consistent but I knew it was time to head to the birth center. I felt the urge to push on the way but wasn’t sure what was happening since this was my first time experiencing any of this. We get there and Hannah met me at the car and I was so happy to be there! I couldn’t make it to the room with out having another contraction and feeling very nauseated. Hannah immediately helped me with a bowl with peppermint oil that helped enough to get me to the room. After they checked me we all realized the baby was ready come out and my urge to push was justified. They filled the bath and got everything prepped for me to give birth. Since I chose suite #1 with the triangular bath tub my husband was able to sit on the edge and be close to me. Donnellyn and Hannah supported me and gave me uplifting confidence and direction thru every push. Once the baby was almost out they helped direct my husband to catch our little boy! It was amazing to have the ability to have such interaction. 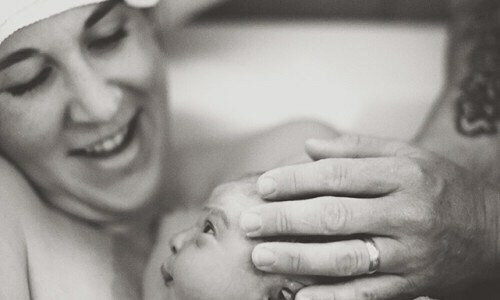 It gave my husband a true closeness that would have never been possible in a hospital. said my placenta showed that my diet was great, my bleeding was minimal which I think is from the Ningxia Red, and I had no need for any sutures. I then had an herbal bath with the baby and was able to really take in the fact that we just brought this little man into the world. Next was the newborn exam which they are very thorough and take all measurements. He was so perfect! 8lbs 6oz and 21 1/2 inches of beautiful baby. It was such an awesome experience and I could not thank the midwives enough for how comfortable they made us feel.